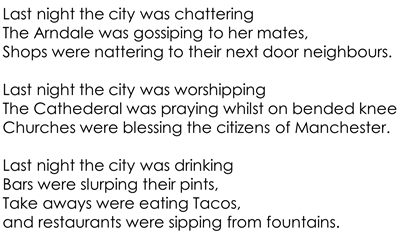 In our reading into writing we have been looking at the poem 'Last night I saw the city breathing' and we used this to create our own poem based on Manchester. Have a look at our ideas.. In our maths we were recapping our multiplication skills reading to move on to more formal methods. We had our grafitti maths skills at the ready and 'hit the button' to see how quick we could recall fact families. In our reading we were looking at vocabulary and how we can work out what different words mean. Mr Webster has got our topic off to a flying start as the children look at the city of Manchester. They had to become history detectives to order events in time. We worked together to finalise the Nando's homework for this half term so have a look on the main class page for a copy of what's in store this half term. We would like to thanks the children for a great first week back and we are really excited to see what the half term holds.